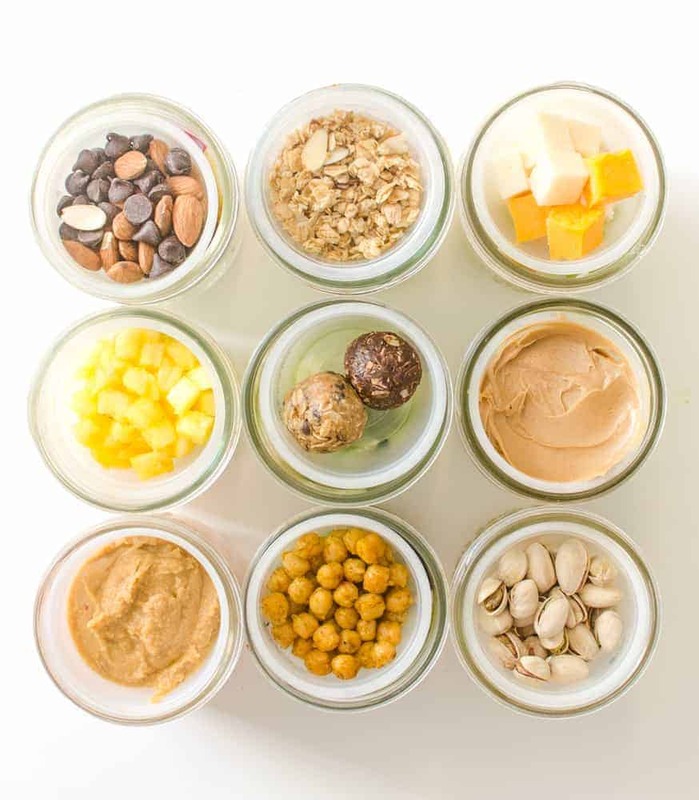 These healthy snacks in jars have been a healthy eating game changer in my kitchen, and I know you are going to feel the same way! I’m SO excited to share this post with you. 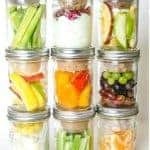 These healthy snacks in jars have been a healthy eating game changer in my kitchen, and I know you are going to feel the same way. Having healthy, simple, easy to grab snacks on hand in your fridge is a lifesaver when it comes to healthy eating, feeding a family, and getting some more whole foods into your diet. 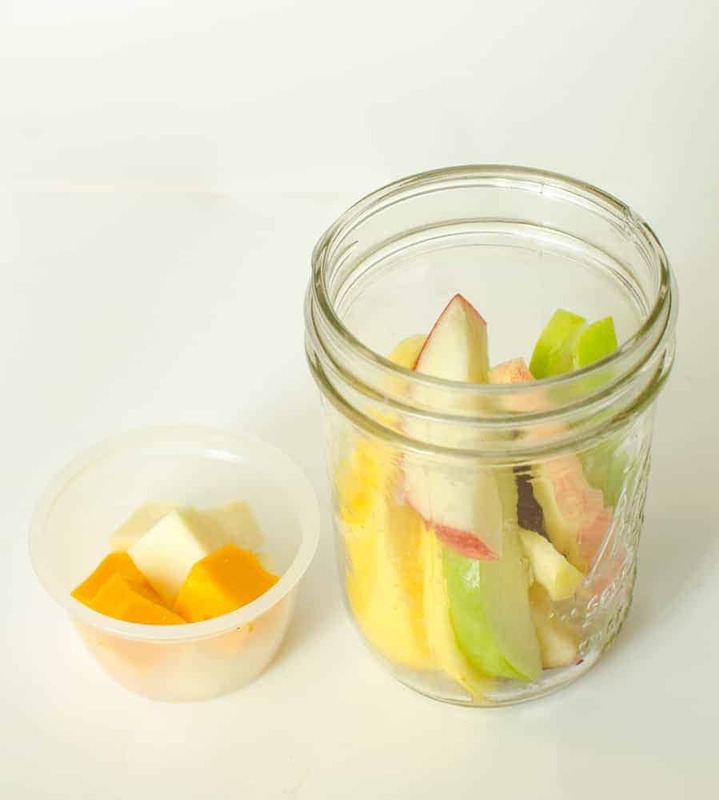 The idea here is that you pack a pint jar with part of your snack and then use another little plastic container (I used fruit cup/applesauce containers that are being repurposed!) with another component of your snack. For instance, you might have sliced apples in the jar and fill the little cup up with peanut butter. The little cup fits right inside the jar and you put the lid over both things and then store them in the fridge. You now how your apples and dip all ready to go. It’s so simple but so convenient to have healthy food prepped and ready to go in the fridge! If you have gotten into the wonderful world of salad-in-a-jar, you know that something magical happens when you put things inside a mason jar in your fridge. If you pack them well, the contents of the jar seem to stay fresh an extra long time. This is true for healthy snacks too! Eat the jars that have things like dairy or “soft” veggies (cucumbers) in them first. The carrots, celery, and broccoli stay fresh a really long time, though – up to a week! Sometimes nuts, seeds, and granola seem to get a little soft in the fridge. That wasn’t the case here! I think that the fruit cups fit up against the lid of the mason jar tight enough that not much air got in. I don’t buy fruit cups, so when I was thinking about these make-ahead healthy snacks, I asked around to a few friends to see if they would save theirs for me. They did and it was easy and free for me to get the little cups. That being said, you can get some fruit cups just for this project or you can buy these plastic cups that were designed just for this purpose. Plan on using wide mouth pint mason jars for this. The fruit cups that I had wouldn’t fit into a regular mouth jar and I had a few different brands/kinds of fruit cups. I really like these screw on lids for my mason jars too. Bonus: they are freezer safe and so are the wide mouth pint jars. They are perfect for storing jam, broth, and extra smoothies in the freezer, too. The healthy snacks in jars possibilities are endless, but I have come up with 10 different combos to get your ideas flowing. When I was making these, I tried to pair a fruit or veggie with some protein so that it was a well-rounded snack. Wash and cut up your cauliflower and broccoli into small florets. Fill the mason jar about 2/3 of the way full with your vegetables. Add some Greek yogurt ranch dip to the fruit cup (great time to measure and use portion control if you are prepping for weight loss), add the ranch dip in a cup to the mason jar, screw on a lid, and place in the fridge for up to 5 days. 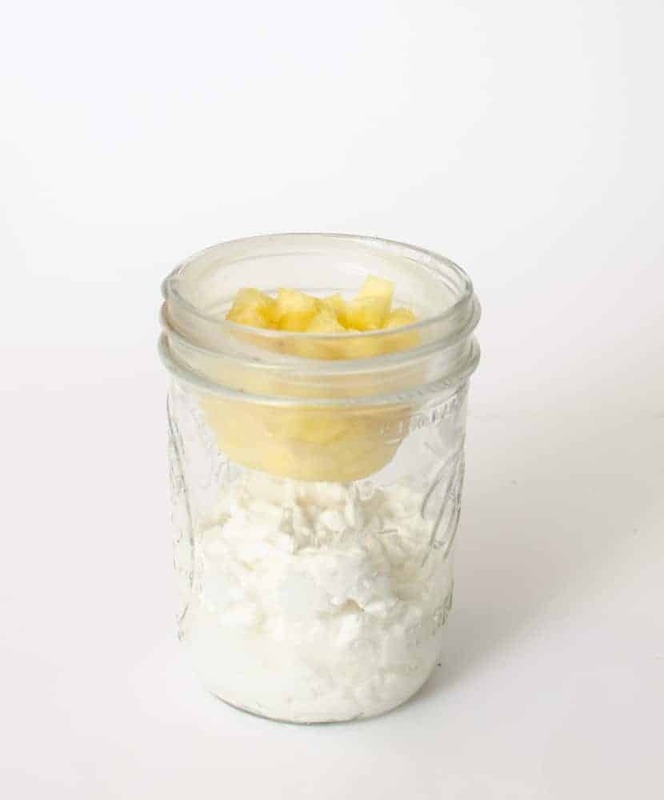 Measure out a serving of cottage cheese and add it to the mason jar. Fill the fruit cup with fruit of your choice (mango, pineapple, mandarin oranges, berries, and even cherry tomatoes are all good). 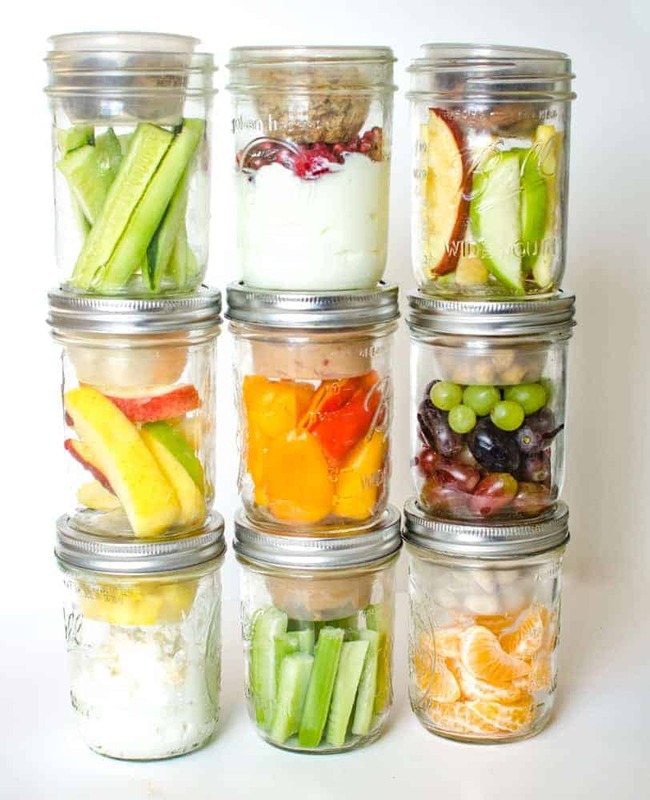 Add the fruit in a cup to the mason jar, screw on a lid, and place in the fridge for up to 3 days. When you are ready to eat, add the fruit to the cottage cheese and enjoy. Place a serving of Greek yogurt in the mason jar and top with your choices of berries (fresh or frozen) and/or pomegranate seeds (arils). Add some granola to the fruit cup (this is my favorite healthy granola recipe). 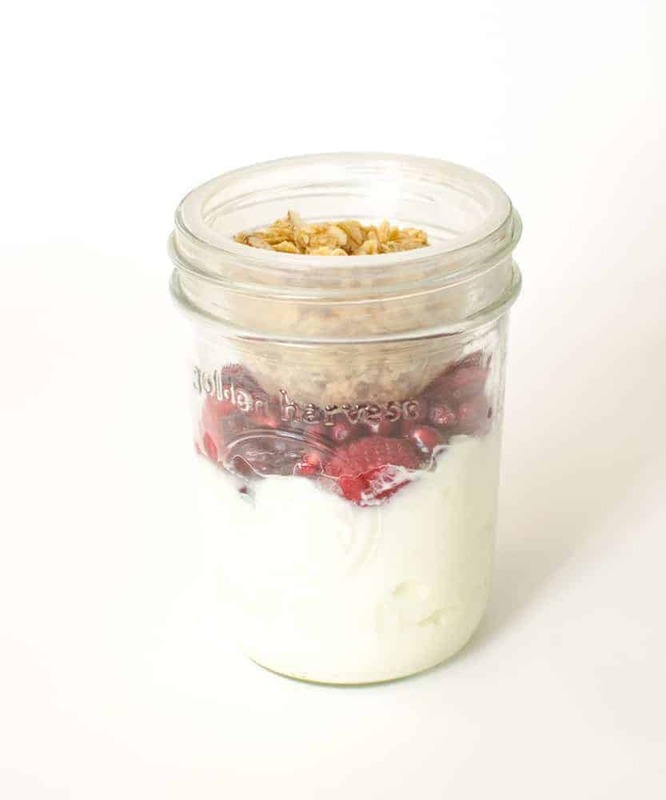 Place the granola filled cup in the mason jar, screw on a lid, and place in the fridge for up to 3 days. When you are ready to eat, add the granola to the yogurt and enjoy. Prep the apples by slicing/coring them and dipping them in something so that they don’t turn brown. You can dip apples in a little bit of lemon juice, Fruit Fresh (it’s absorbic acid), or even a bit of orange juice. Place apples in the bottom of the mason jar. Fill a fruit cup with a serving of cheese cubes. 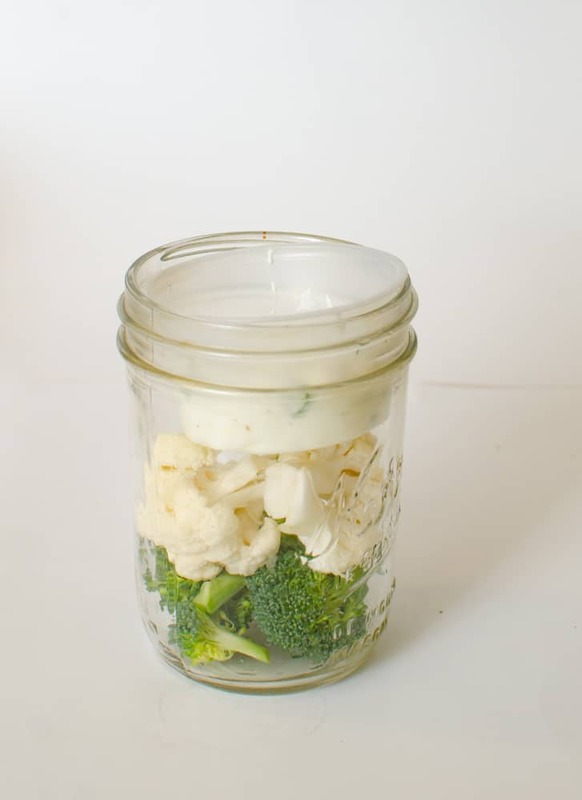 Place the cheese cube filled cup in the mason jar, screw on the lid, and place in the fridge for up to 5 days. Prep your cucumber by washing it and slicing it into rounds or spears. 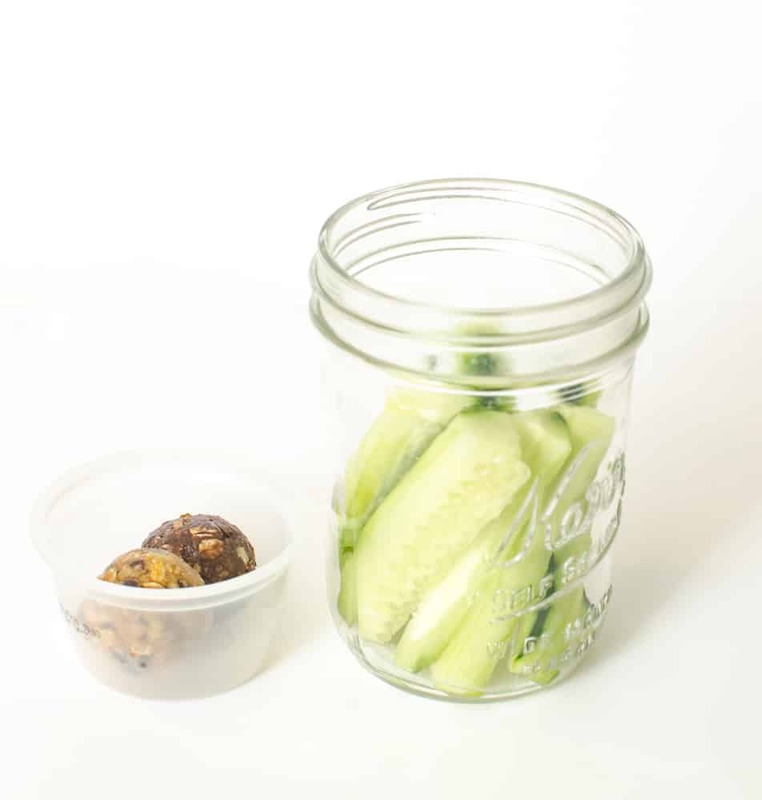 Place cucumber in the bottom of the mason jar and fill the fruit cup with a date ball or oatmeal energy bite (or two). Place the “bite” filled cup in the mason jar, screw on the lid, and place in the fridge for up to 3 days. Cucumbers, especially cut ones, don’t last as long as other more firm vegetables. Plan to eat these at the beginning of the week. Here are some of my favorite date ball recipes and I have lots of oatmeal energy bites coming your way! Prep your celery by washing, trimming, and cutting it into sticks. Cut the sticks short (about 2.5 inches long) so that they fit in the mason jar and you still have room to add your cup of peanut butter. 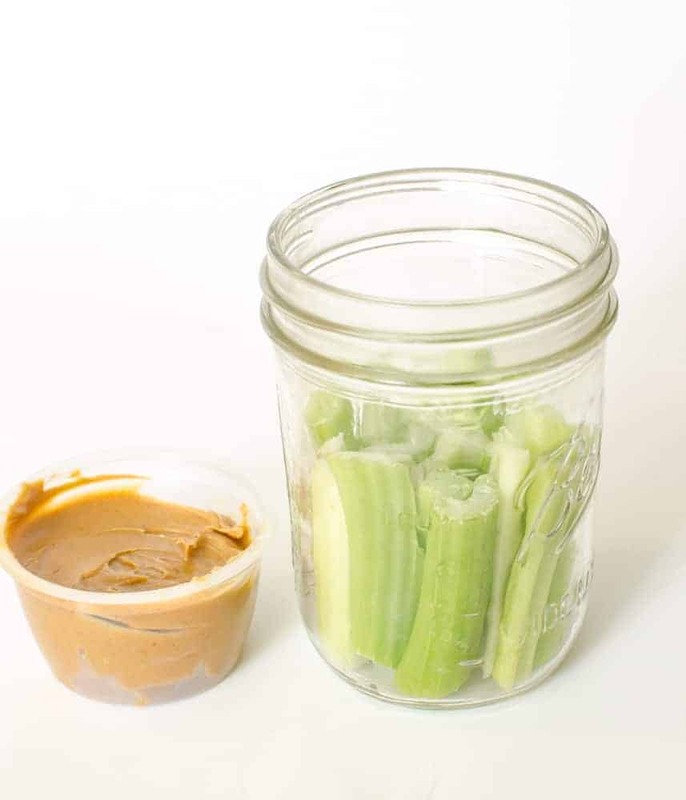 Place the celery in the bottom of the mason jar and fill a fruit cup with a serving of peanut butter. Place the peanut butter filled cup in the mason jar, screw on a lid, and place in the fridge for up to a week. Celery lasts a really long time like this! Prep the grapes by washing them and taking the grapes off of the stem. Fill a mason jar 2/3 of the way full with grapes. Fill a fruit cup with roasted chickpeas (recipe coming soon! They are so good!). 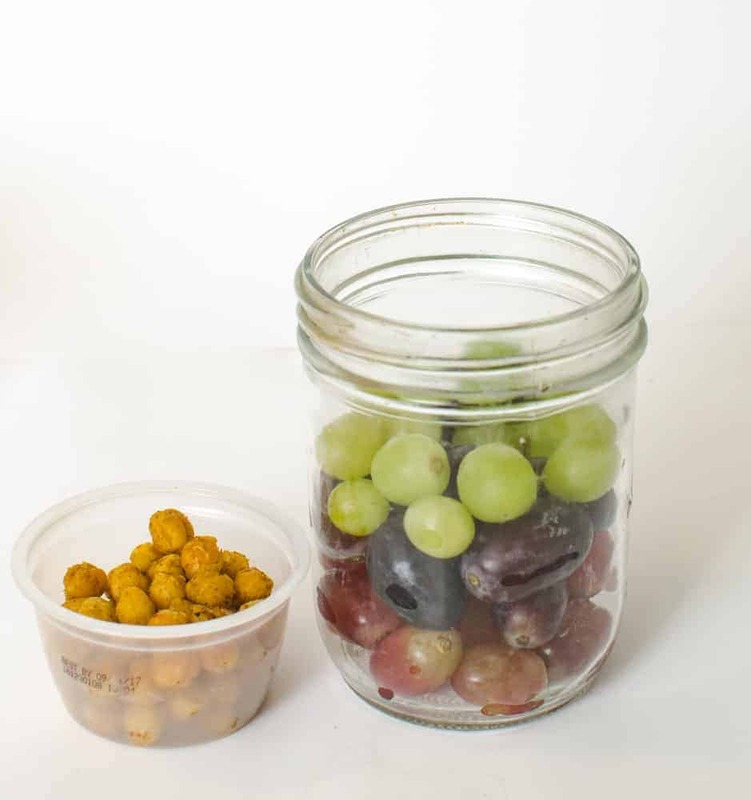 Place the roasted chickpea filled cup in the mason jar, screw on a lid, and place in the fridge for up to 5 days. 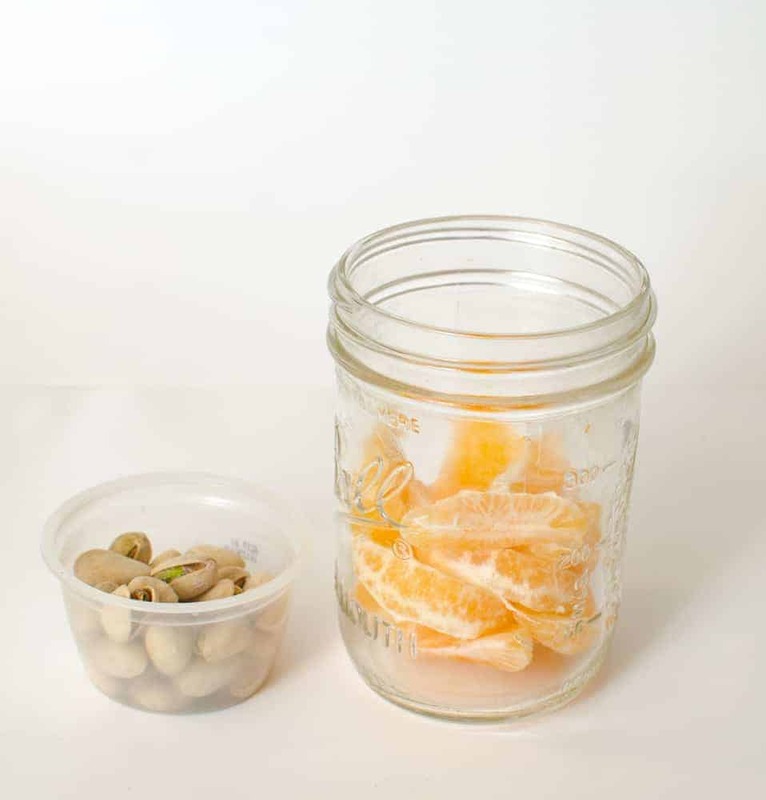 Peel and segment a mandarin orange (or other small citrus fruit) and put the pieces in the jar, or, if it is small enough, pop the whole fruit into the bottom of the jar. Fill a fruit cup with a serving of pistachios. Place the pistachio filled cup in the mason jar, screw on a lid, and place in the fridge for up to 5 days. Prep the apples by slicing/coring them and dipping them in something so that they don’t turn brown. You can dip apples in a little bit of lemon juice, Fruit Fresh (it’s absorbic acid), or even a bit of orange juice (my kids fuss if they are dipped in lemon, but orange is great). Place apples in the bottom of the mason jar. Fill a fruit cup with a serving of nuts and dark chocolate. Place the nut and chocolate filled cup in the mason jar, screw on the lid, and place in the fridge for up to 5 days. I really like these extra dark chocolate chips just FYI. Prep bell peppers and carrots by washing and slicing. Fill the mason jar 2/3 of the way full. Place a serving of hummus in the fruit cup. 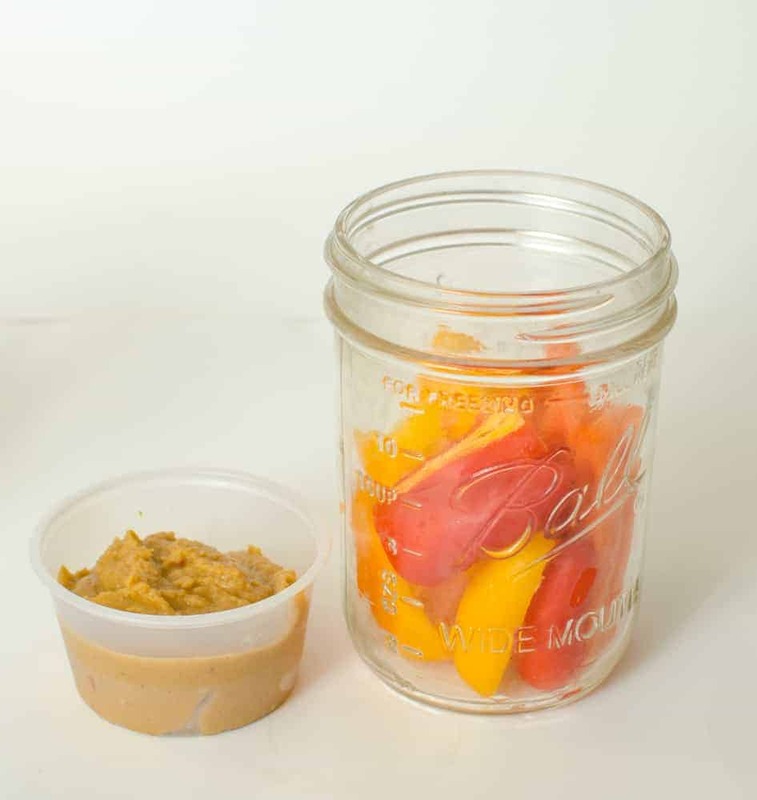 Place the hummus filled cup in the mason jar, screw on a lid, and place in the fridge for up to 5 days. If you do only carrots and not bell peppers, you can keep it in the fridge for a week. Carrots that you peel and cut on your own last much longer than “baby carrots,” just FYI. I’m not sure what they do to baby carrots, but they seem to get slimy or soft much faster than a big carrot you prep yourself. If you are using baby carrots I’d eat within 3 days. Make 10 or 1 or 1 of 10! No matter which you choose you’ll have a fridge full of healthy snacks all week long! Isn’t that fun and easy? I’ll make up a batch of these when I’m prepping food for my family at the beginning of the week and then the kids and I munch on them all week long. I’ll normally pick 3 or 4 combinations and make a couple jars of each for the week. I cut up extra veggies when I’m filling my snack jars, and add the rest of the rest of the already prepped vegetables to my weekly Veggie Box. I used mango here, though I love this with pineapple and oranges, too. These aren’t really recipes, just ideas to get you started. If you love carrots and peanut butter (I do! ), then by all means, make that a combo. I just did some fruit or a vegetable with some kind of protein so that it was a filling, fiber-packed, fabulous snack that you can grab and go. These are great for kids, for adults, to take to work or school, to eat in the car, or to have for your late night snack. You are going to LOVE having these on hand. If meal prep is your jam, you can check out my favorite freezer to slow cooker ebook here. Best thing that ever happened to this busy mom! 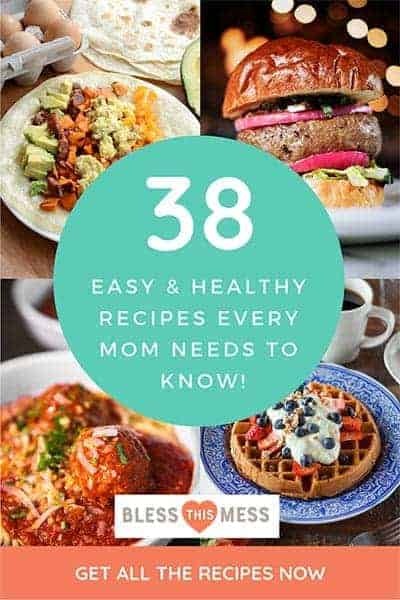 Don’t forget to share this post with all your trying to eat better, busy, mom friends. They’ll love you forever! Thank you for being here. I so appreciate you. Sign up to receive emails from Bless This Mess and get a FREE copy of 10 Healthy Snacks You Can Prep in Advance. 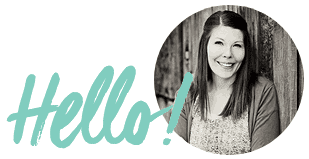 You’ll get a once a week newsletter with freebies, exclusive recipes, and other great content that only comes in email from Bless This Mess. No spam. No junk. You can unsubscribe at any time. These are awesome — thanks! I’ll prep a few to throw in for snacks this week. What clever ideas! 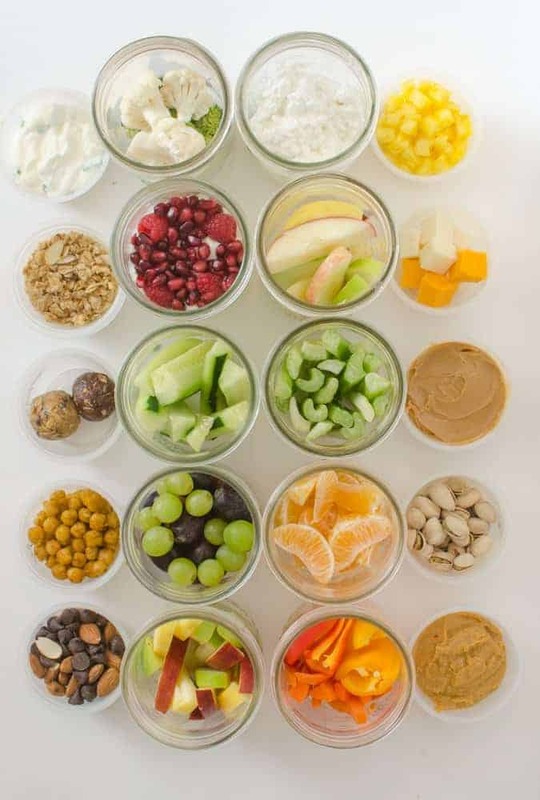 love these ideas but what are you using to hold the dips/ nuts? It fits perfectly in the mason jar? I talk about it at the beginning of the post if you need more info. They are fruit cup containers (like individually packaged applesauce or mandarin oranges!). They are just washed and recycled for this purpose. I also linked to a cup on amazon that fits too. So fun! Love these and looking forward to trying new snack combinations! What size of mason jars ? Wide mouth pint work perfectly! I adore these tips. There are so many great on the go ideas. Excited to make snack time for all of us easy and healthier. Love this idea! I can’t wait to try this. ENJOY Amber, they really do make snacks and after school time so much easier. This is such a brilliant idea! I think I’ll try it using silicon muffin cases instead of the plastic cups (just because I have them already) and see how it goes. Thanks for sharing! And I landed on your page again! Haha, way to go with this blog. It’s AWESOME.